From the very beginning, Mazda has focused on one thing and one thing alone, building cars that connect with people emotionally through the way they look, the way they feel and, most importantly, the way they drive. The 2017 Mazda6 has been equipped with Mazda’s newest innovation; SKYACTIV® VEHICLE DYMANICS with G- Vectoring Control. This new technology helps achieve a smoother, less fatiguing for you and your passengers. This new Mazda technology emulates race-car driver weight-transfer techniques making the 2017 Mazda6 driven by the average driver, handle better and make passengers feel more comfortable. 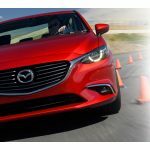 This is a significant step forward for Mazda in making mid-price cars and crossovers carve corners like high-end German sport sedans and maintain arrow-straight stability on long, straight highways. 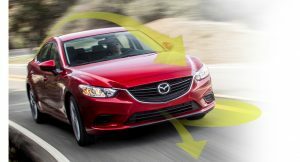 Mazda G-Vectoring Control debuts on 2017 Mazda6.